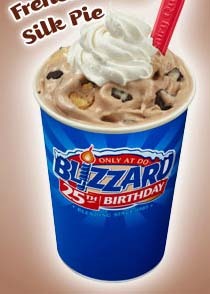 I should have started counting the number of DQ blizzards I eat back in March when DQ opened for the season. Pretty sure I’m over 30 now. Possibly 40. Here is why I love my new favorite kind of DQ blizzard, french silk pie blizzards: Because they taste like french silk pie. But with ice cream. Holy crap they are so yummy with the chocolate pieces and the chunks of pie crust. And the whip cream. Yum Yum Yum! Perfect ending to my day today! My medium long mid-week run is back, and I love it! I think it’s my favorite workout each week. It is SUCH an awesome feeling to get double digits done before 6:00 a.m. And these are my runs where it’s just me and and my thoughts – I’m not distracted by the group or worrying about intervals or hitting certain paces or anything. I just put one foot in front of the other and go. And sort out whatever life stuff needs sorting out. 11 miles done this morning. Love it! Cycling vs. Running thought: It is much easier to spit while running. I have definitely not mastered spitting while cycling. I just manage to make a mess of myself and my bike every time I do it. Tips, anyone? I was talking running with a friend this week who questioned the wisdom of marathon pace miles in a long run. He is fast – like super fast – and didn’t do any MP miles for his most recent round of training and had a kick a$$ race time. I know alot of the “experts” have MP miles in the long run. And I like MP miles in a long run – mostly for confidence reasons, though I’m sure there is a physical training effect too. Anyone else have thoughts on whether MP miles in a long run are beneficial? (This weekend’s long run for me is 16 miles with some MP miles – not sure how many – mixed in). Oh, Cindi, why did you have to put that blizzard pic up? I’m having a DQ jonesin’ as it is and now it’s like an obsession. My dip cone day is Sunday. I’m going to try to hold out!! My tip – lean a bit to the side, aim down and to the side. The wind from your speed will just blow it back in your face otherwise. Also, when you’re less skittish in groups, try and be far enough in front of the person behind you, or the last in the group so nobody catches any of the spray. One of my favorite blizzards. Had one last week and, in fact, are having one right now. It’s miracle treat day. French Silk Pie. Yum! !